Toshiba introduces the AL13SE, a new line of 2.5" 10,000 RPM 6Gbps SAS HDDs for enterprises. Toshiba’s Storage Products Business Unit, a division of Toshiba America Electronic Components, Inc., and a committed technology leader, today announced the AL13SE series of 2.5-inch 6Gb/s SAS interface hard disk drives (HDDs), which offer enterprise-class performance in capacities ranging from 900GB1 to 300GB. 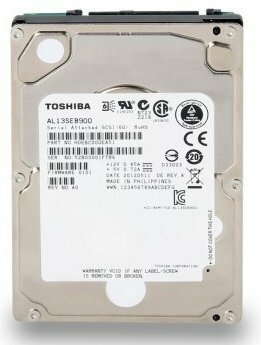 The AL13SE is the first 10,000 RPM class model enterprise drive from Toshiba to achieve 900GB capacity and is also the first of Toshiba’s 10,000 RPM drives to employ a dual-stage head positioning actuator that provides additional performance gains, including a 32% increase in sustained transfer rate. Designed for even the most demanding mission-critical applications, the AL13SE series features an operating reliability rating of 2,000,000 power-on hours2, a 25% increase over prior-generation drives. System compatibility is also assured through usage of the industry-standard 512 byte sector size. In keeping with Toshiba’s leadership in power efficiency design, the AL13SE Series uses Supported Enhanced Power Condition State technology to lower RPM idle speed. The AL13SE series is also available mounted in a 3.5-inch bracket3 for use in legacy based 3.5-inch servers and storage enclosures, providing the same 10,000 RPM class spin speed, 6 Gb/sec SAS interface, and reduced power consumption benefits available with small form factor drive technology.